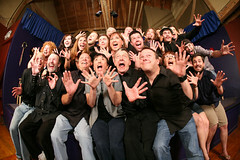 Our shows are a fast-paced mix of scenes, improv games and music.If you like Whose Line Is It, Anyway?, you’ll love us! Recommended for ages 12 and above. The performance lasts approximately 1 hour, 45 minutes. Groups of 10 or more: Please reserve tickets. If you’d like the VIC to reserve seats, payment must be received in advance. Contact us to make reservations and arrange payment.